THAI WAI – Dream becomes reality – What a fantastic day! Hands that have been designed and constructed in recent months by Vera, Willem, Emiel and Frank, and many others. The hands have the shape of the Thai “Wai“. 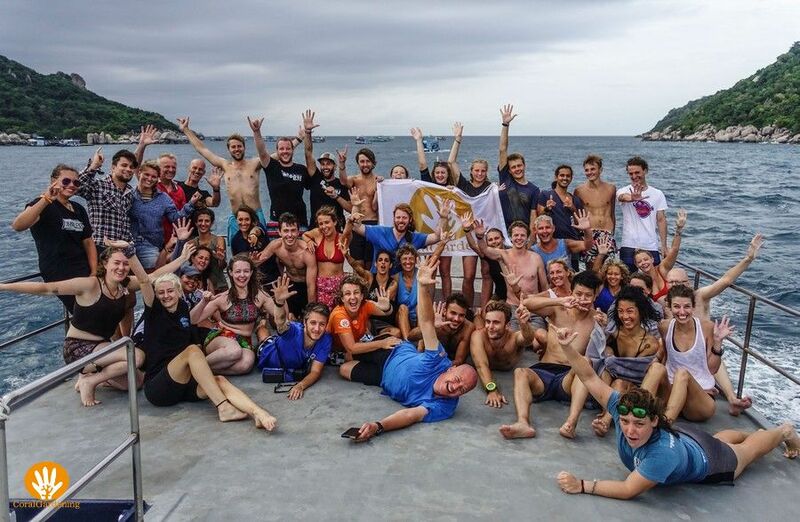 The Wai is the Thai gesture and also our gesture to greet and thank the community of Koh Tao for making a positive impact on their island. A few days before they were deployed, there was a ceremony on the beach, next to Sairee Cottage Diving. This caused attention and interest from many volunteers who wanted to help a ‘hand’ in placing the structure underwater a few days later. 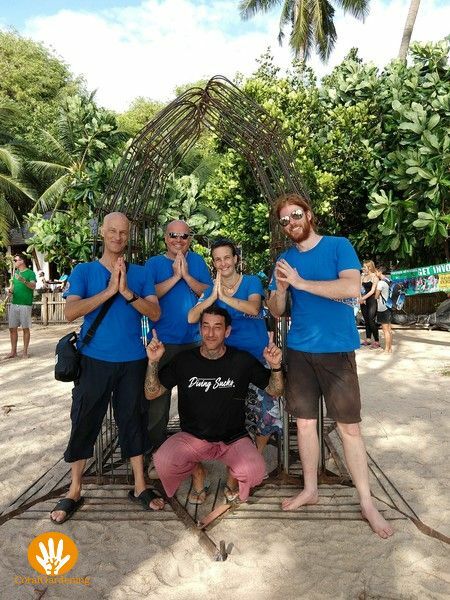 Technical CoralGardening team with Thai Wai hands. 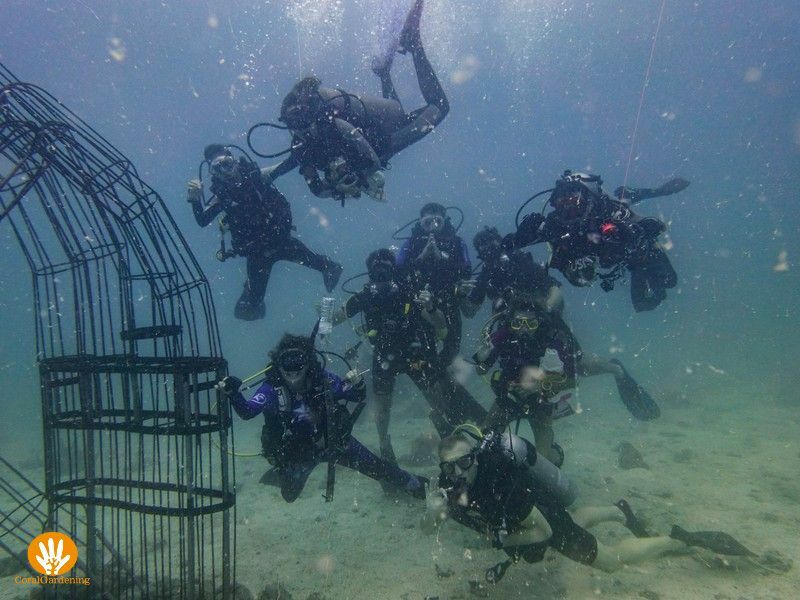 The next generation of Eco-divers have also tested the hands and found it to be good. 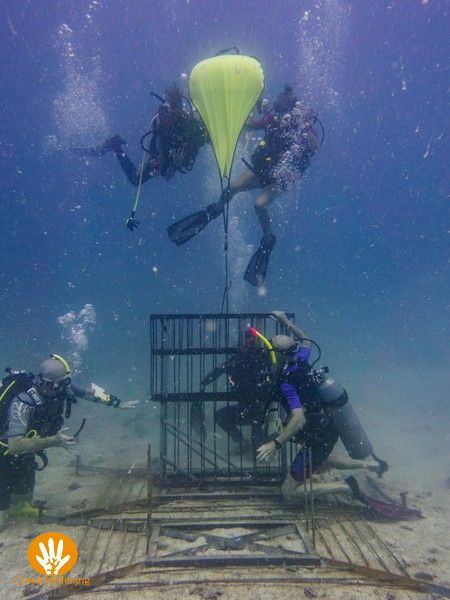 “A few years ago I came into contact with Vera and Frank and heard of their dream to realize a CoralGarden that is both intended as a new reef to create more life in the sea, but also a nice place for divers to see beautiful underwater life. As a diver and a lover of documentaries, especially from Jacques Cousteau (from the sixties of the last century and the first in black and white! ), my interest in contributing something to the CoralGardening foundation was immediately awakened. In recent years I have seen the CoralGarden grow from the Netherlands. 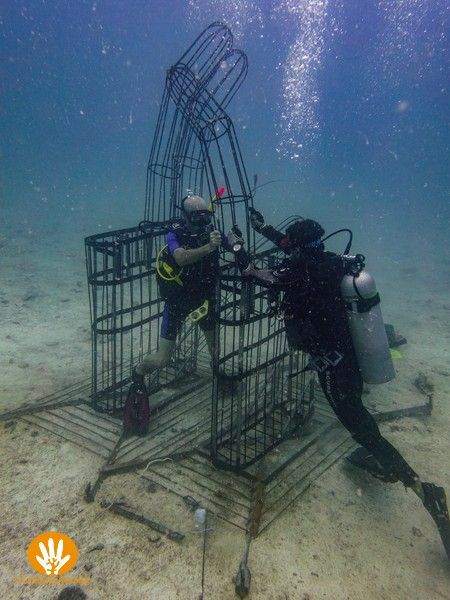 In the meantime it had been possible to place 8 flowers under water by beautiful donations. The show-piece, the Wai Hands, was placed on July 29, and I could be there! The day was not only festive but also a logistical challenge. After all, the hands are more than 3 meters high, sometimes there is current, strong winds and therefore strong waves and steel and seawater are enemies, as Willem says. Rehearsal: how should the hands be put together? 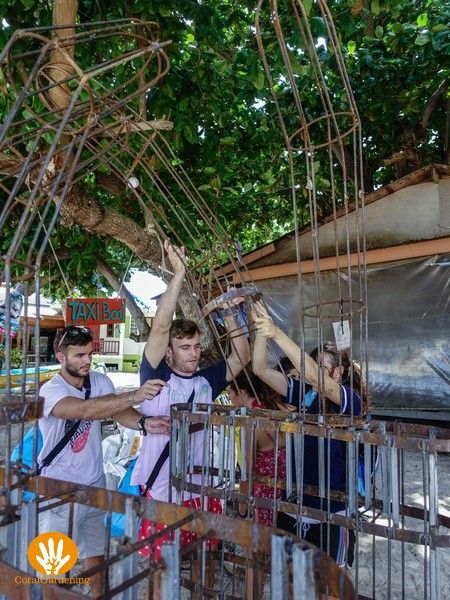 With careful thinking and experience with previous placement of the flowers, the design team made the foundations, palms and the ten fingers as separate components. The hands could be easily assembled under water. A simple modular system that we will certainly take with us to future projects in perhaps other countries ..? 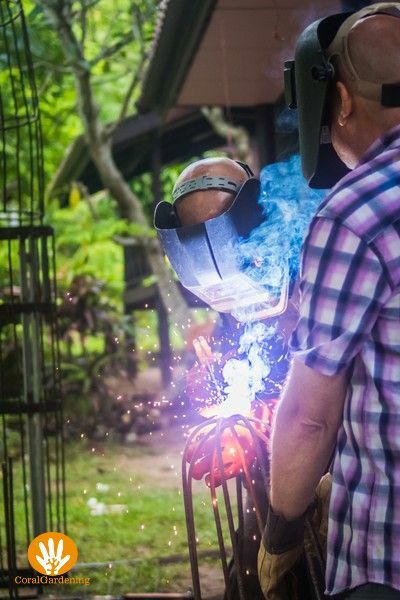 To allow the hands to stand upright, the palms are placed on a steel foundation. These have to be ballasted, so there are also around 30 bags of stones. These foundations and hands are made of steel and therefore rust through the seawater. This process is delayed by an electric current that is passed through from land. The current is generated by a solar panel which is placed on land earlier and from which about 200 meters of cable runs under water to the hands. Now all we have to do is to walk the parts of the workshop to the beach, and from the beach to small longtails. There everything, including the approximately 25 volunteers, are being brought to the big boat that takes us to Hin Wong Bay. Big Blue and Mojo Divers make their boats available for this special mission. We are very grateful to them for that! The palm of the hand is placed on the foundation. 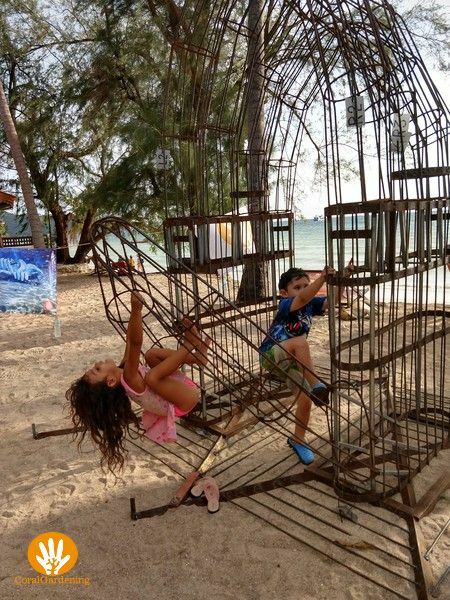 Once in Hin Wong Bay, everything from the boat was brought down with liftbags, by divers. Underwater the hands were put together and the foundations were covered with stones. A finger is mounted on the palm. The first swim-through through the Thai Wai hands. I thought it was a fantastic experience to be able to be part of this enormously important work for nature and the coral! 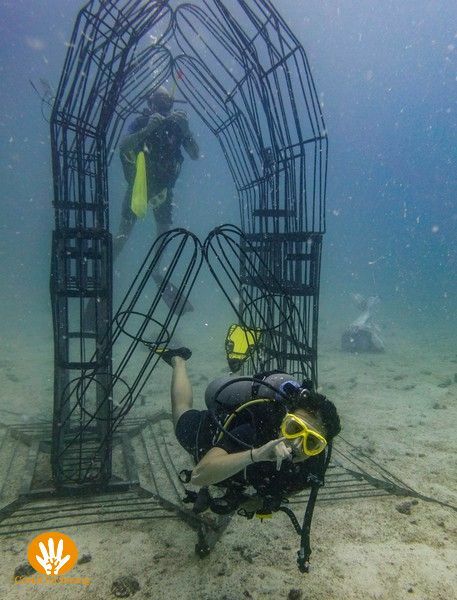 Many other types of artificial reefs will have to be placed to restore the coral reefs. But at the same time, I see how many people volunteer for this good cause and are willing to spend days and sometimes weeks. That is also very encouraging for Vera and Frank to continue with their good work. We still hope for the efforts of many volunteers, but also for many donations to continue this work for many years in different places around the world. Donate for materials through CoralGardening.org.